New video now up: See www.youtube.com/leereichfarmden. Whoosh! Summer is speeding past. Cicadas have come and gone. Same goes for Japanese beetles. Temperatures have cooled dramatically. And now it’s raining plums. That’s a good thing, and something not easily achieved in this part of the world without, at least, some sprays. The main threats come from plum curculio, Oriental fruit moth, black knot, and brown knot. The first and the last are my most serious plum pests, curculio causing young fruits to plummet to the ground early in the season and brown rot turning nearly ripe fruit into masses of gray fuzz. — and less diseases — following rain or dew. While pruning, I also kept my eyes out for any thick, tarry coatings (black knot) or dark, sunken areas (valsa canker) on stems; such stems got lopped back 6 inches into healthy wood. I do all this every year and some years I still get no plums; this year, as I wrote, it’s raining plums. Raining??!! Yes. That’s because we harvest daily by giving branches a slight shake, which brings ripe plums raining down. Once we’ve gathered the good drops into a basket and infested and infected ones into a compost bucket, the chickens move in to clean up any missed drops, which also helps keep pests in check. The variety is Imperial Épineuse, which originated in France about 1870 and made it stateside in 1883. It’s a prune plum, so can also be dried. The fresh flavor is so good that I’m more than willing to accept a crop 2 out of every 5 years. A certain amount of luck is involved, especially here, in getting a plum crop because my site is less than ideal as far as temperatures and humidity. I credit this past spring’s perfect temperatures for my current luscious harvest. Fingers crossed for next year. As I was harvesting the first pears of the season (also a very nice crop this year, thank you) — the variety Harrow Delight — I noticed a lot of columbine plants colonizing the mulched ground beneath the pear trees. As a matter of fact, columbine and an occasional thistle are the main weeds there. These columbines aren’t our dainty, native columbines but, rather, hybrids of cultivated columbines. They’re not flowering now, but the robust leaves are telling. My columbines aren’t necessarily weeds. They started out as cultivated hybrids that I planted many years ago. Year after year of cross-pollination has jumbled the genes to create new hybrids, natural ones. They’re somewhat different from the originals and from each other but I’ve never seen one that wasn’t attractive. The flowers are long past, of course, having morphed into dry seed heads that rattle down seeds every time I brush them, sowing more plants. The whorl of leaves are still green and lush with the delicate look of maidenhair fern. At some point, the number of columbines tips the scales into weediness. Some, I see, have the audacity to be edging their way into the vegetable garden. My plan is to maintain a fluid and, hopefully, not too tenuous balance between columbine-the-flower and columbine-the-weed. I can’t imagine ever having to plant columbine again. 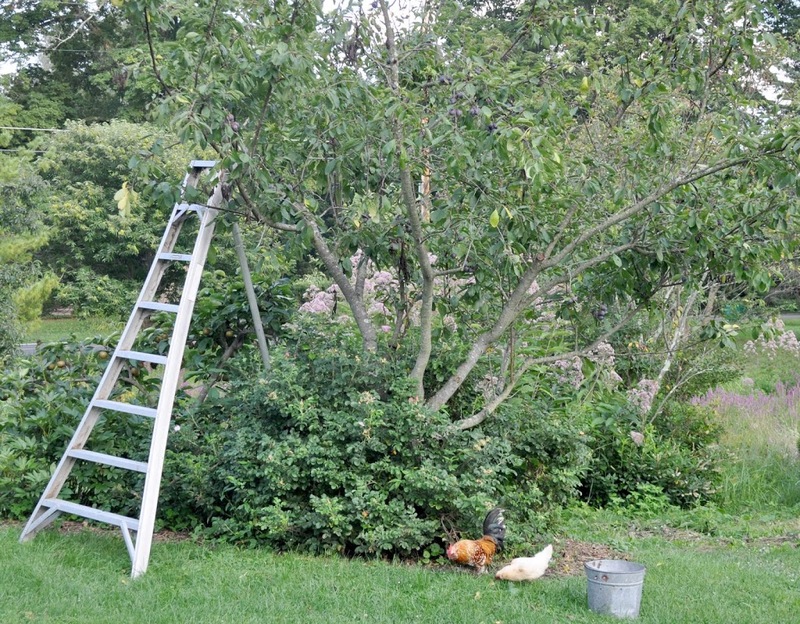 Looking up from the columbines, I continue to pick pears — not an easy job. The difficulty comes from trying to figure out when to do it. Pears must be harvested underripe because they ripen from the inside outward. Allowed to fully ripen on the tree, their insides become brown mush. The fruit must, however, be sufficiently along on the road to maturity before harvest if it is to ripen well. A few clues help tell when to pick: A lightening of the skin’s background color; the raised pores on the skin becoming brown and corky; the stalk separating easily from the stem when the fruit is lifted and twisted. These changes are subtle and require judgement. Last year I harvested too late so this year I’m scrapping judgement and picking by calendar date gleaned from various sources after taking into account their locations. The story doesn’t end with harvest, though. Before the early pears are ready to eat, they need a few days refrigeration. (Outdoor temperatures are sufficiently cool to chill late-ripening pears.) After that, small batches can be sequentially taken from the refrigerator to finish ripening at room temperature. A short window, then, presents itself when flavor is at its best. “There are only 10 minutes in the life of a pear when it is perfect to eat,” wrote Ralph Waldo Emerson. But what a sensuous 10 minutes. This entry was posted in Uncategorized and tagged columbine, Harrow Delight, Imperial Epineuse, pear, plum. Bookmark the permalink. Trackbacks are closed, but you can post a comment. Unfortunately we are fighting black knot. I’ve read up a bit on it and have been pruning below the disease on the stem, as well as having pruned branches wrapped up and taken away by our garbage removal people. Also will begin the copper sulphate spraying. Any other suggestions? When we first moved to our farm in the Catskills, we had a prune plum that produced zillions of plums. The next season it died of black knot. Totally covered in those awful, twisted fungi. Pruning off knots and spraying with copper, like you said. Some varieties have some resistance to black knot — Fellenberg, Brodshaw, Santa Rosa, and Shiro, for example. President is said to be resistant. I subscribed… Very nicely done videos. Thank you. More on the way.